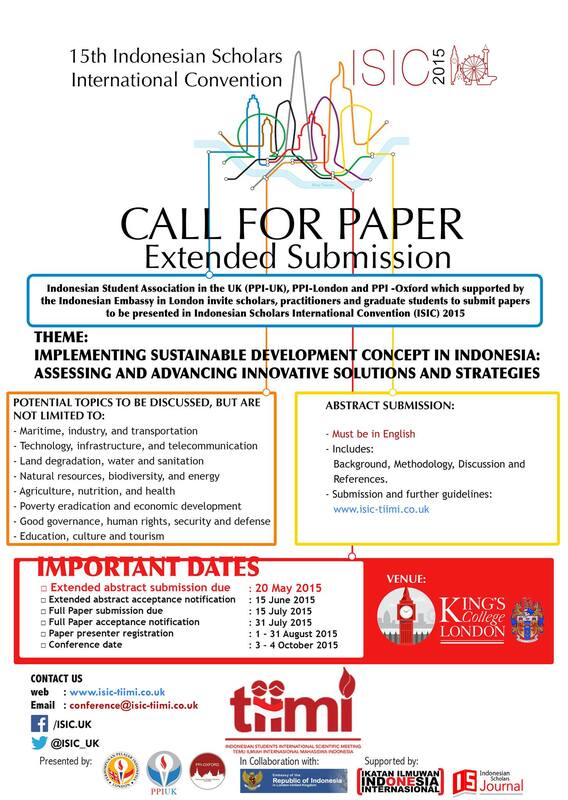 Indonesian Student Association in the UK (PPI-UK), PPI-London and PPI-Oxford which supported by the Indonesian Embassy in London invite scholars, practitioners and graduate students to submit papers to be presented in Indonesian Scholars International Convention (ISIC) 2015: 15th TIIMI Conference. The theme of the conference is Implementing Sustainable Development Concept in Indonesia: Assessing and Advancing Innovative Solutions and Strategies. The extended abstract should include: Background, Methodology, Discussion and References. Extended abstract, full paper and paper presentations must be in English.